Twenty thousand people have been rescued from unprecedented flooding in the southern state of Louisiana's capital, the governor said Tuesday. Most of those rescues were made by the National Guard and state authorities, but city residents with boats, trucks and kayaks have taken it upon themselves to help out. "A tremendous response by the people of Louisiana taking care of their own," said Governor John Bel Edwards. Danielle Mesman, a resident of Baton Rouge's Staring neighborhood, and her husband were unaffected by the flooding. But that didn't stop them from getting involved. Saturday night, she ventured out to the Catholic center where she frequently volunteers and where her children had become friends with a Syrian refugee family before the flooding. "As I was walking through I saw this family — this 11-year-old girl — I saw her first," Danielle Mesman told VOA. The girl's face lit up as she recognized the parent of her new friends, and Mesman was moved. "I texted my husband and said, ‘I'm bringing a family home.’"
The seven members of the Syrian family had been resettled in Baton Rouge just over a month ago and were stuck at the Catholic center over the weekend, unable to return to their inaccessible new house. "We loaded their luggage and all of them in a van. That was Saturday night," Mesman said. Meanwhile, her husband, Chris, was out on unfamiliar streets in Baton Rouge, sometimes carrying his boat through dry streets before jumping back in and fighting currents, trying to reach people who were stuck. "I lost contact with him. I didn't hear from him all day really," Mesman said. "That first night was Saturday night — they were still in shock so they went to bed pretty quickly," Mesman recounted. "Since then, the kids are jumping on the trampoline, playing soccer in the backyard … they're playing UNO [card game]. We're fine." Recovery will continue long after the floodwater recedes. Families — including the one that the Mesmans took in — have no idea when they can return home, or what condition their homes will be in. Some 40,000 homes have been damaged "to varying degrees" in Baton Rouge, Edwards said Tuesday. The number is expected to rise as floodwater continues to spread. Eight new parishes in Baton Rouge were added to the federal disaster declaration Tuesday morning, following a weekend of record-breaking rains. "This is not the time to let our guards down," Edwards said in a statement. "This event is ongoing; it is not over. Even if the sun has come out in your area, we do not know when the floodwaters will recede, and they will continue to rise in some areas." The Amite River, a source of flooding for many neighborhoods in the city, had risen an unprecedented 4.3 meters over the weekend. By Tuesday morning, eight people had died in the floods. 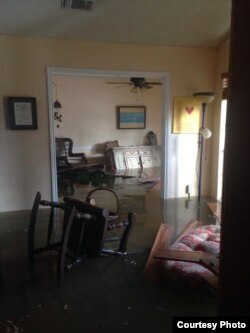 Flood damage is not new to the city or the state. Earlier this year, the same region of Louisiana and coastal areas of neighboring Mississippi were hit by flooding that killed at least four people and damaged thousands of homes. The city of Baton Rouge also welcomed thousands of victims of Hurricane Katrina, which devastated New Orleans in 2005, with death toll estimates as high as 1,800. The memory of that tragedy, the last time FEMA was heavily present in Louisiana, is fresh in the minds of many residents. FEMA administrator Craig Fugate assured the people of Baton Rouge on Tuesday that the agency is committed to short- and long-term aid in the capital. 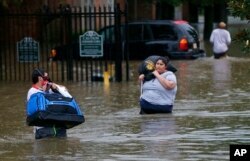 FILE - Residents wade through floodwater in the Chateau Wein Apartments in Baton Rouge, Louisiana, Aug. 12, 2016. He said the current priority is finding temporary housing for those in shelters, but getting schools and businesses back open and finding permanent housing for those facing damage to their homes will follow. He also assured residents, many of whom have expressed frustration with the lack of media attention their tragedy is receiving, that FEMA will not forget them. "You had the Olympics, you've got the election — if you look at the national news, you're probably on the third or fourth page," Fugate said. "FEMA understands this is a very large disaster, affecting tens of thousands of people." But in the meantime, many residents will rely on the generosity of their neighbors and a newfound sense of community. "Chris is out again today," Mesman said of her husband, who has been traversing the city on boat, on foot, and in a truck since Saturday. "Delivering supplies, helping his friends put up sheetrock ... I imagine it will be like this for a while," she said.